April 10, 2012 - The FAA on Monday joined with the U.S. Department of State, U.S. Trade and Development Agency (USTDA), and the Transportation Security Administration (TSA) together with Brazil's Ministry of External Relations to announce the launch of the U.S., Brazil Aviation Partnership. The Aviation Partnership is a unique public-private partnership that is enhancing bilateral cooperation in areas such as airport expansion, airspace management, safety and security. These programs will support Brazil's aviation infrastructure development priorities, while connecting U.S. companies to the growing business opportunities in the sector. The Memorandum of Understanding establishing the Aviation Partnership was signed by Secretary of State Hillary Clinton, USTDA Director Leocadia I. Zak, TSA Administrator John Pistole, and FAA Acting Administrator Michael Huerta on behalf of the United States; and by Minister of External Relations Antonio Patriota on behalf of Brazil. 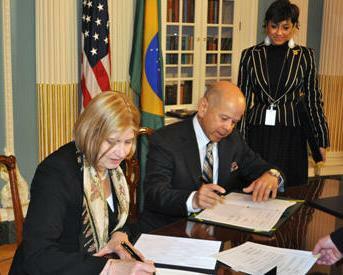 USTDA Director Leocadia Zak signing the MOU to launch the US-Brazil Aviation Partnership. Pictured with Director Zak is Acting FAA Administrator Michael Huerta. Initially, six companies will participate in the Aviation Partnership, alongside the supporting U.S. and Brazilian Government agencies. "Brazil and the United States have a long history of cooperation in the aviation sector, and the Aviation Partnership will open more opportunities to work together," stated USTDA Director Zak. "We are excited to work together to support the growth of Brazil's dynamic aviation sector and deepen our commercial engagement with Brazil." The launching of the Aviation Partnership during President Rousseff's visit to the United States is timed to better coordinate U.S. engagement with Brazil in the aviation sector. As a result of rapidly increasing air traffic because of Brazil's growing economy and the upcoming World Cup and Olympic Games, Brazil is facing an urgent need to increase its investments in aviation infrastructure in order to accommodate the expected growth. U.S. companies are eager to connect to the export opportunities created by these investments. As the first official activities under the Aviation Partnership, in June 2012, USTDA will host a delegation of Brazilian aviation officials on a reverse trade mission to the United States to familiarize them with U.S. technologies, best practices, and regulatory approaches for airports modernization. In October 2012, USTDA will host a Latin American Aviation Summit in Miami, Florida, to introduce hundreds of U.S. aviation company representatives to aviation officials from countries across Latin America, including Brazil.